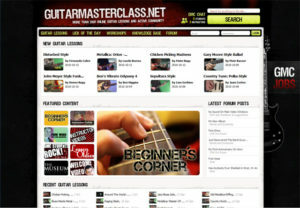 Guitar Master Class.net is a online guitar playing community, where subscribers can access a range of video guitar lessons covering many musical styles, and communicate with other subscribers and instructors. With a wide range of lessons from beginner level, through to insane, you can learn songs, scales and various techniques for playing guitar. Instructors from all over the world provide Video lessons covering everything from jazz and blues, country, traditional and classical, funk, through to rock and metal. Most instructors provide written notes and basic guitar tablature to accompany the videos, and some will even provide multiple angles of their playing so you can see everything they are doing. Each lesson also gives you space within it to keep your own personal notes, and the ability to connect with the community regarding the lesson through the knowledge base, forum, and video responses. You can see statistics for the lesson, including members also practicing it at the same time as you, total lesson views, and ratings. If you think a lesson is really cool and you want to share it with your friends, there is an option to email them through the site. There are also a number of series dedicated to musical styles and techniques, so you can gradually build up your expertise working with the one instructor. The Workshop section allows you to connect with instructors and other members of the community in real time. You can participate in virtual bands, work on collaborations with other members and instructors, and even work on lessons with instructors and be graded while online. 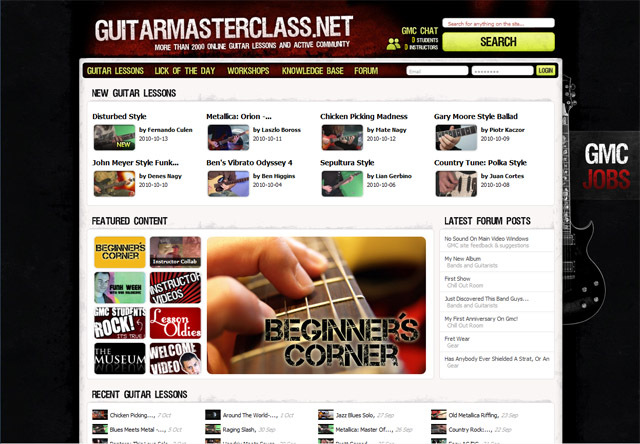 Guitar Master Class also includes a knowledge base wiki, including articles about guitar players and bands, gear reviews, theory lessons, information on the instructors, and many more things. Also included is a member forum and chat room, where you can communicate directly with other subscribers and the instructors on the site. There are a variety of subscriber plans, from one month, through to six monthly installments that will get you a discount on the subscription. If you are looking to begin playing guitar, or just want to develop your skills further, and the online teaching environment appeals to you check out Guitar Master Class. Thanks to John at Guitar Master Class I will be having a Guitar Master Class give-away soon. Keep an eye on my blog for details.